Few weekends ago, my family and i went for a getaway. It was a prompt decision and the destination that we picked was not very far from our house, that was Putrajaya! Anyway, check in was breeze, and in no time, we were already in the room! Just take a look at their face! Went to the bathroom, and i am so happy the toiletries are a lot and they were in very nice packaging! (compared to some hotels, they just give you only bar soap and some shampoo). The winning point will be none other than the POOL! 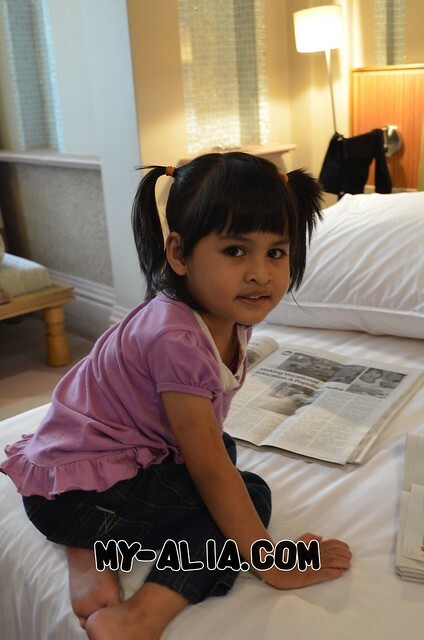 Yes, it is a must for my little Alia when we check in at any hotels. Anyway, Pullman Putrajaya Lakeside is indeed a very nice place to stay, be it for business or pleasure. You will find your money worth every ringgit here!